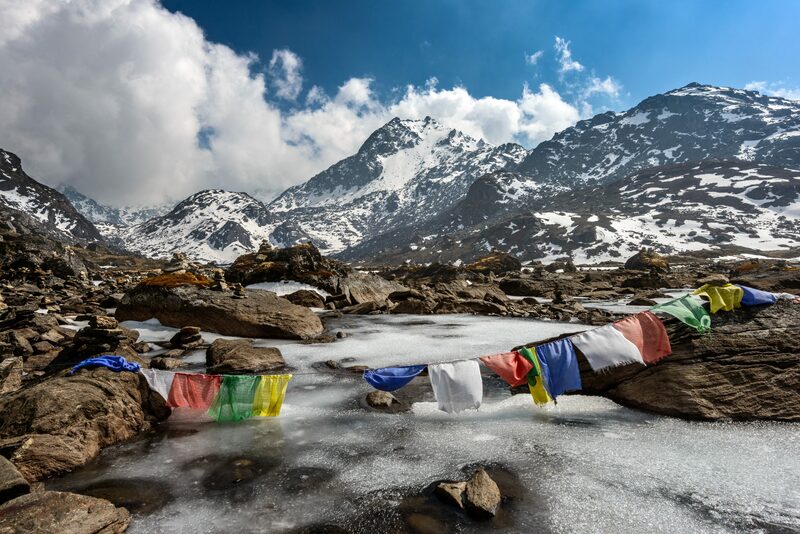 Mist is rising over the snow-capped jagged Himalayan peaks before you. Your boots are muddy and you don’t care. It’s been two days’ of steep hiking in the “Land of the Thunder Dragon.” locals in kimono-like robes and pointed bamboo hats dress up yaks in bright traditional outfits. Others wrestle or dance. You may even see the king of this remote nation where pursuit of happiness literally trumps anything else. Anything you’ve ever known before feels like a different world now. 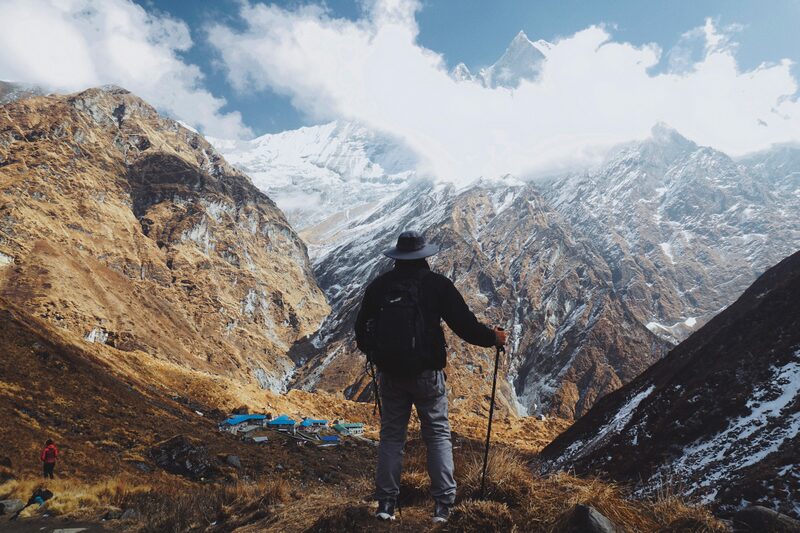 This 14-day trekking adventure with Modern Adventure and BACKPACKER magazine sounds like fantasy. In fact, it’s Bhutan. This journey into the long-isolated nation’s northwest corner takes in the most sacred sites (like the cliff-hugging Tiger Monastery), the king’s own Royal Highlander Festival, stunning mountain passes, a week’s worth of Himalaya trekking, hot springs and heritage hotels, and immersion in timeless traditions thriving at dzong monastery forts, local markets and remote villages. If you love combing culture with adventure, join us to see the rooftop of the world. Bhutan is unlike any place you’ve ever experienced. 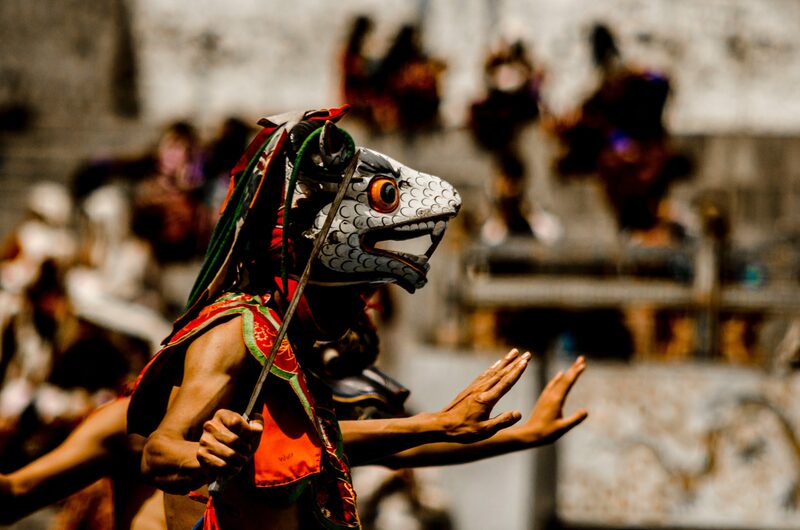 And we’ll have the privilege to experience the two-day Royal Highlander Festival—accessible only by foot and rarely seen by foreigners—and its celebration of nomadic highlander culture, its heartfelt devotions and spectacle. You’ll never forget our time together in Bhutan. This is the perfect blend of trekking and culture. We’ll experience local life at markets and remote mountain villages, visit centuries-old monasteries, and follow parts of Bhutan's legendary Snowman Trek en route to the king's own Royal Highlander Festival, accessible only on foot and rarely seen by Westerners. We’ll spend a week camping in the wild, hiking on trails accessible for most age levels who maintain good physical fitness and are prepared for the demands of trekking in remote mountainous areas. On non-hiking days we'll relax and explore Bhutan's sights and culture. We trek in style! The trip is fully supported with an expert Bhutanese guide, camp cooks, horsemen, and yak wranglers. We’ll carry lightweight day packs while the rest of our gear is transported for us. Our nights are spent equally camping (gear provided) and in comfortable hotels. Roundtrip flights from Bangkok to Bhutan included. True wilderness. Epic exploration. Deep backcountry. Cultural immersion. We’ve scoured the earth for hidden gems and in 2019 we are inviting you to join us on one of these exclusive trips designed by Modern Adventure in collaboration with BACKPACKER magazine. Let's explore the trails less traveled, together. Wrestlers, a sea of traditional headdresses, sipping tea with the King of Bhutan... unforgettable. 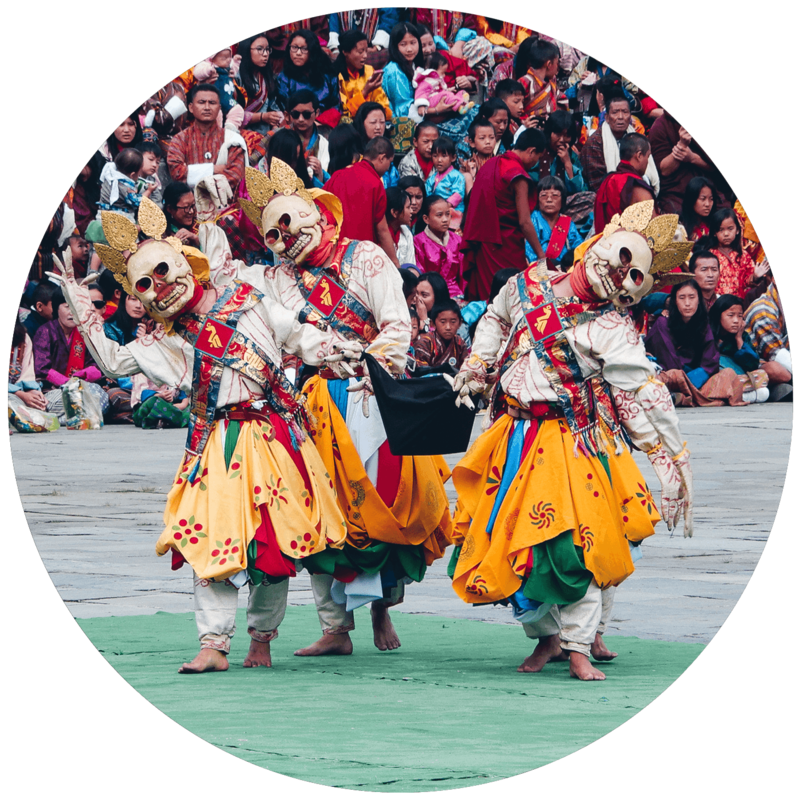 This is a rare opportunity to experience the king's own Royal Highlander Festival, splash in Himalaya hot springs, trek in the world's most stunning mountain scenery, visit monasteries, and get to know the gracious people of Bhutan. Our Himalayan adventure begins! 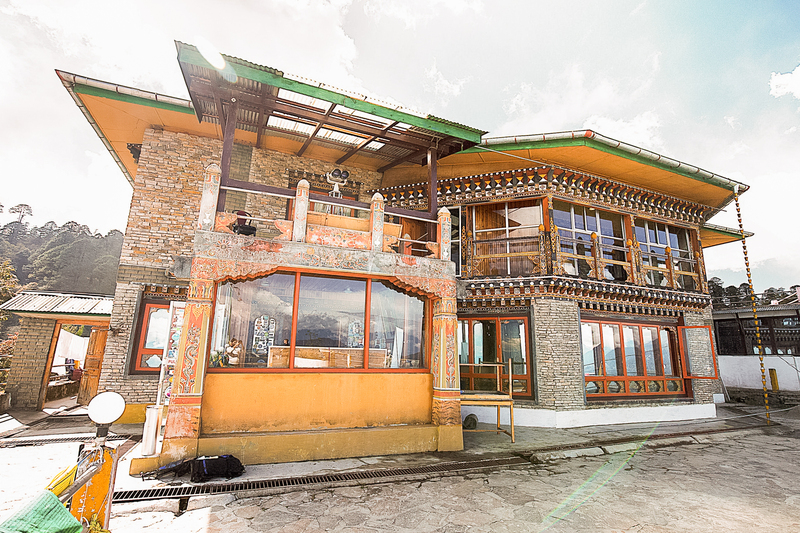 We meet up in Bangkok for the flight (included in the price and coordinated for you) to Paro, Bhutan, where we get acquainted right off with a short hike to a 7th-century monastery. At a dinner we’ll cover our trek plan, check our gear, and have a toast for the journey to come! 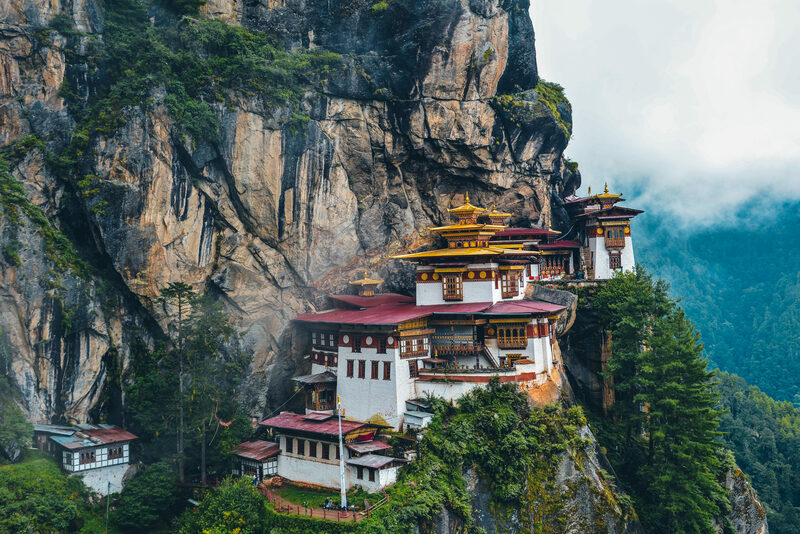 The next day we’ll climb to Bhutan’s most iconic and sacred site, the Tiger’s Nest Monastery (Taktshang Goemba). It’s a steep hike up to the site clinging along a cliff face, capped with views of a rhododendron-filled valley as a rainbow stream of prayer flags seemingly tethering the mountains. Afterwards we head to the capital Thimphu, in time to immerse ourselves in the sights, sounds, and exotic smells of its weekend market. 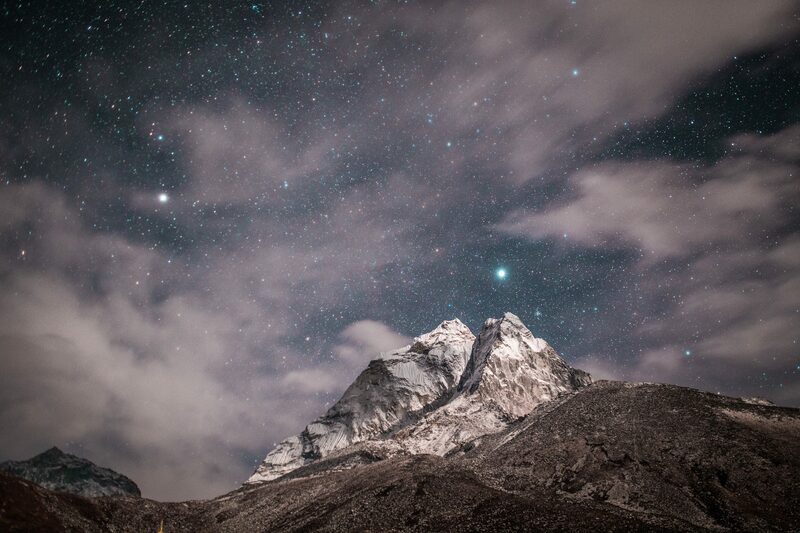 Each day gets us deeper into the mighty Himalayas. 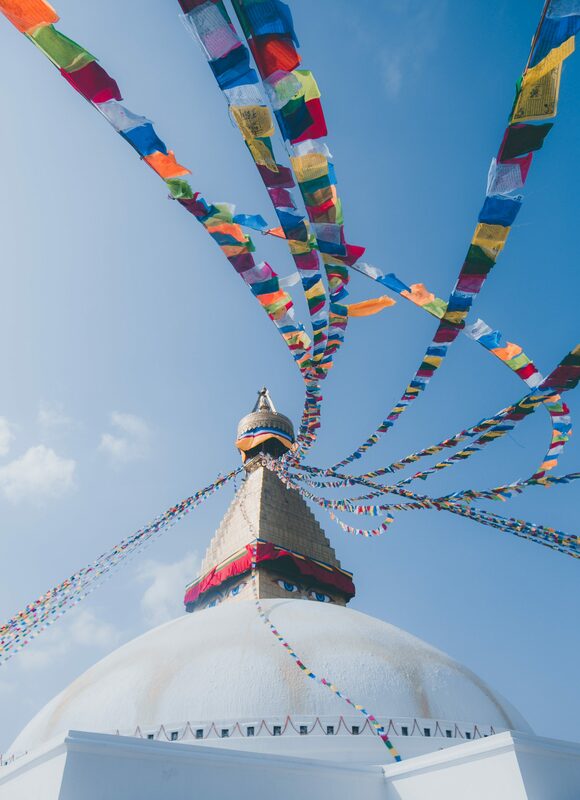 After a hearty breakfast, we leave Thimphu on a mountain drive to the Dochu La Pass, where we’ll see a parade of prayer flags hovering by an impressive collection of 108 chortens (stupas), built as a memorial to local soldiers in 2005. (We can add our own flag to the collection.) Views, particularly on autumn mornings, sprawl across the mountain range. Unforgettable. The next morning, we drive to Punakha Gasa, stopping to see the Gasa Dzong and for a hike to a hot springs, then set up camp. We rise, pack up, and hit the trail. Up the trail. It leads us through thick forests of juniper and fir, sometimes over logs used as bridges over clear mountain streams, the for panoramic views while crossing the Barri La pass (3,900 m / 12,800 ft). Then we descend towards our campsite, a clearing by the majestic Koina River. Our boots get a little muddy today, as we hike along the Mo Chhu River, way up from where we saw it two days before, then up and down some steep ridges. 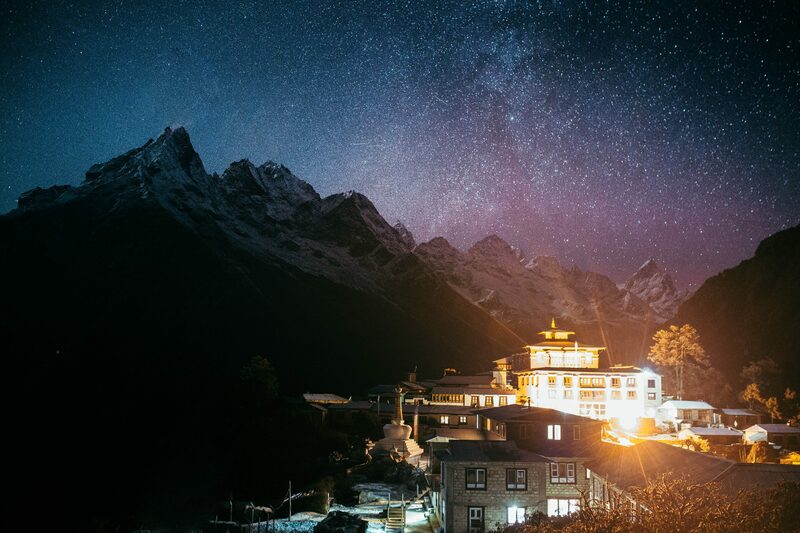 Ahead a spectacle awaits: a true Himalayan village in the clouds, where we set up camp for two nights – and get a serious dose of Bhutanese mountain culture. Village life stirs outside your tent this morning. Out there, too, is Bhutan’s king. 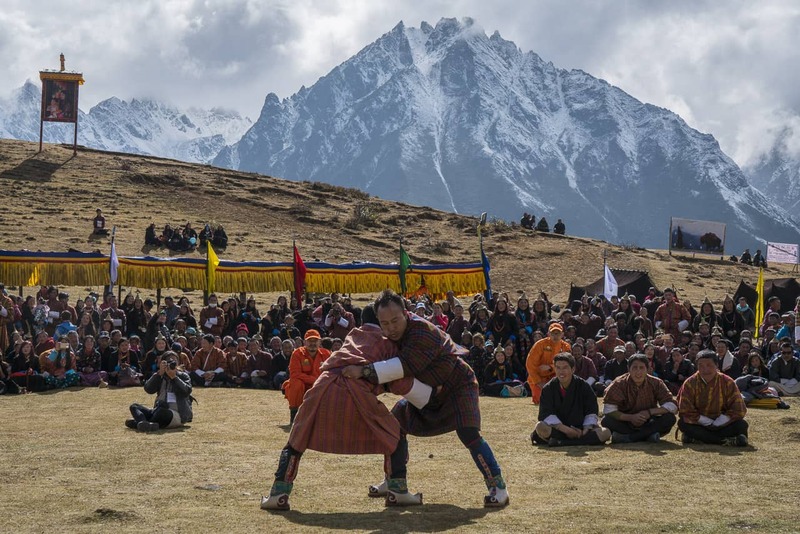 Today we’re attending his incredible creation in the mountain village of Laya: the one-of-a-kind Royal Highlander Festival, established in 2016 by the country’s fifth king, Jigme Khesar Namgyel Wangchuck. 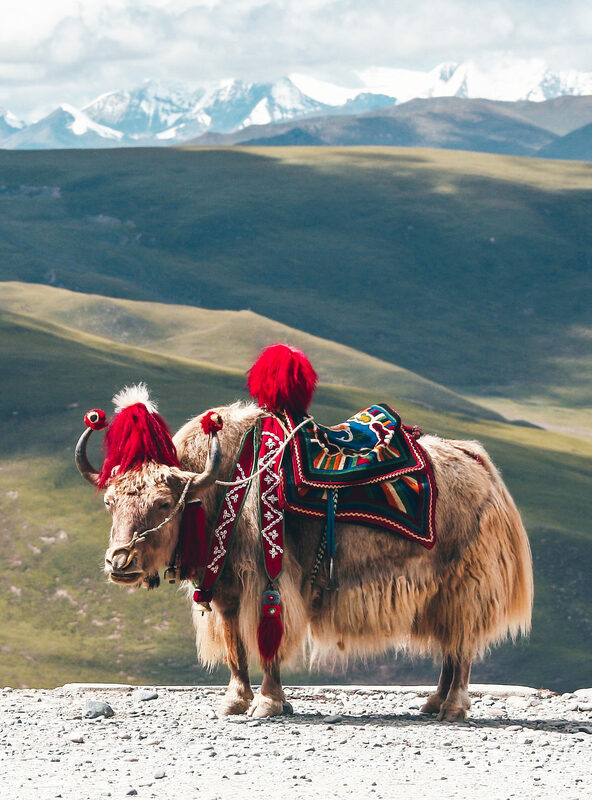 We’ll spend the day seeing yaks get dressed up, locals wrestle and race horses, then sample local foods—including yak meat and a maize-based alcohol drink—and have hot butter tea with the king! Mountain dress will be abundant here, too: conical beaded hats made from bamboo and brightly colored kimono-like national robes. This is a rare opportunity. The only way to get here is by foot, trekking, so it’s a day’s immersion in mountain life that’s rarely seen by outsiders. You’ll be talking about festival, and our unique access and experience, for years to come. Much of the next two days center on admiration of one of Bhutan’s all-star peaks, the snow-covered Gangchenta, or Tiger Mountain, near the Tibet border. After a festival day, we’ll rise, eat and hike out as morning birdsong fills the forest around us. Ahead, our campsite is at a perfect meadow set on the banks of the moraine-fed Kangko Chuu river. In the morning it’s breakfast with glorious views of the mountains, then we head out, peering over other towering mountain passes, before returning to Laya village for a low-key afternoon. The next morning we begin our two-day trek out of this Himalayan paradise, with another night on the Koina River before reaching the Gasa Tsachu hot springs. 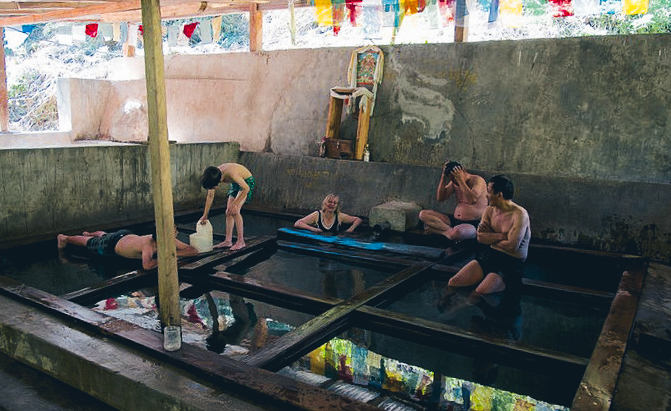 The Gasa Tshachu hot springs is the ideal stopping point for a Highland trek. We’ll revive ourselves in the hot water and relax before driving to the Dochu La Pass for a last night’s look across the the top of the world’s peaks – at a stunning mountain-top hotel. In the morning, we’ll drop by a school of Bhutan’s 13 traditional arts (weaving, carving, paper-making, blacksmithing) and meet the elusive national animal, a stocky horned antelope called takin, at the Motithang Tatin Preserve. Locals believe the unusual animal is magic, made from the skeletons of a cow and goat. Afterwards we return for our final night in Pora, with a farewell feast where we can relive our days together in the Himalayas. Sadly our time this magical mountain kingdom has ended. After a last breakfast today, we’ll pack up our gear—say farewell to our new friends—and head for the airport. Until we meet again, or as they say in Bhutan’s Dzongkha language, log jay gay! Heritage hotels and villas overlooking jagged peaks, camping comfortably under the stars—we stay in style in the Himalayas. Our first stop is an intimate resort in Paro Valley, where all 21 rooms come with expansive views over the valley and Paro Dzong in the distance. We’re in a timeless village, surrounded by apple orchards and rice fields. The resort looks traditional, but inside it's fully modern with a spa, bar, and spacious rooms—each with seriously unforgettable views. 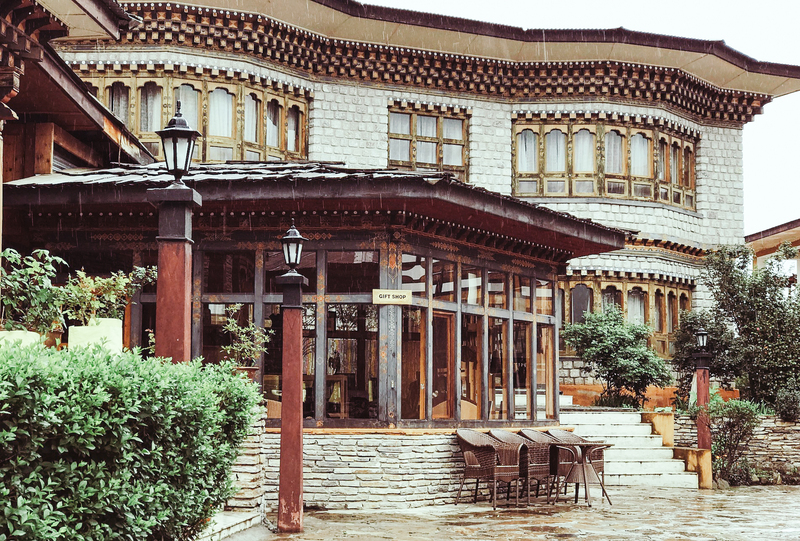 Our time in Bhutan's capital of Thimphu is spent in one of the country's most luxurious—and historic—accommodations. 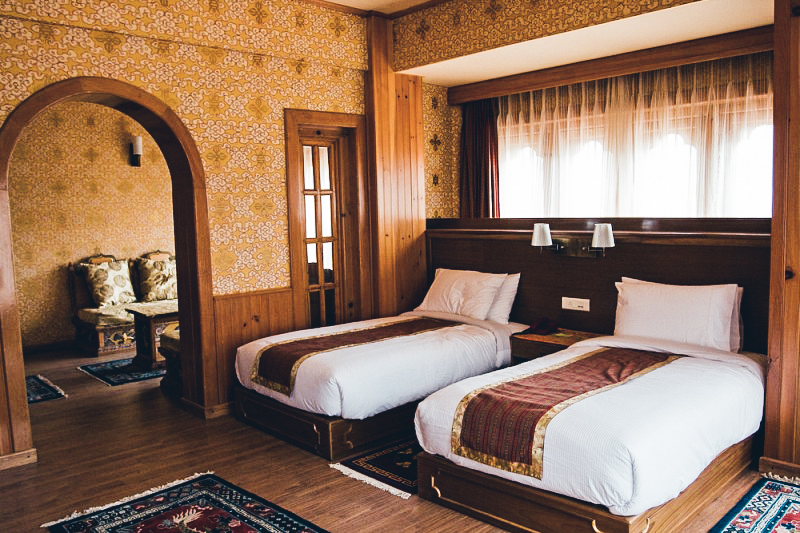 Walking distance from the heart of the Thimphu historic center, this heritage hotel is made up of four ornate traditional buildings and has plenty of places to relax: spa, swimming pool, bar, and restaurant. Rooms lean toward traditional, with colorful Buddha prints and local textiles—and Wifi if you need it. Our resort in Punakha really takes on the Himalayas, set on a hilltop and almost melding into the lush forest. 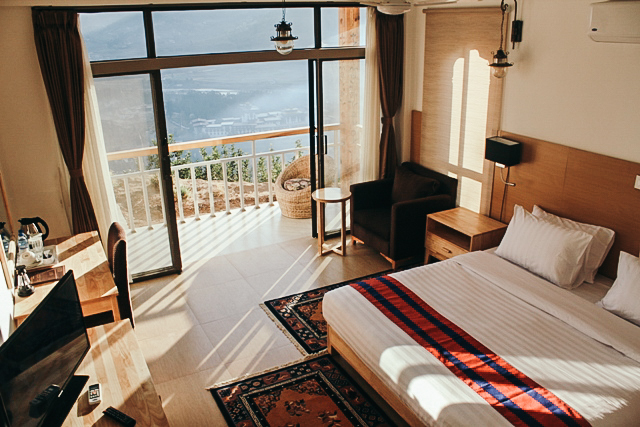 Villa balconies look over forested hills, rivers and the majestic Punakha Dzong. This is the starting point for our Himalaya trek, and the ideal place to relax and sample the scenery to come. The heart of our Bhutan experience is trekking the mountains. 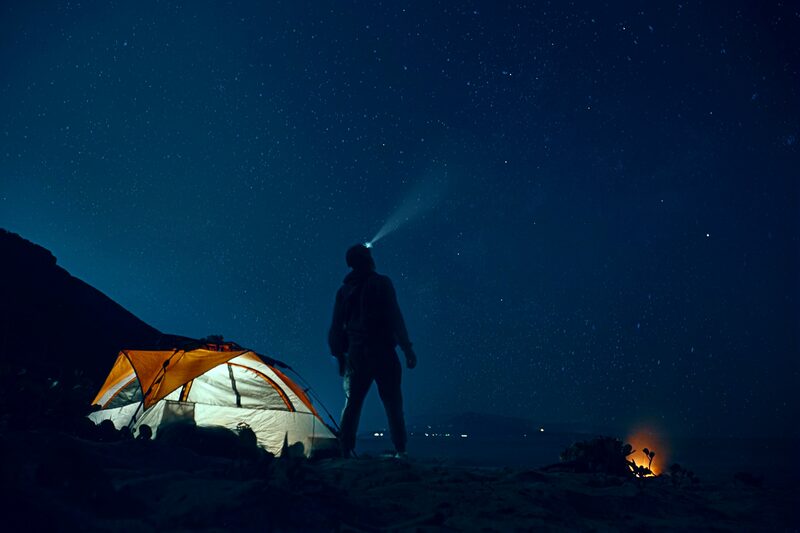 We provide expedition-quality tents, trekking poles, and group-size tarp shelters to house the best nomadic cooking equipment in the camping world. We’ll eat well along the way, our cooks using local ingredients to make a mix of Bhutanese and regional specialties to restore ourselves after a day on the trail. After over a week in a tent and climbing mountain pass, we’ve found the perfect place to settle in and revive. Rooms are large and cozy, with traditional art and modern amenities. And the views! A jagged line of snow-capped Himalayan peaks from every window, including Gangkhar Pheunsum, the world’s highest unclimbed mountain. Round-trip flights to/from Bangkok (Thailand) and Paro (Bhutan); accommodations for 13 nights; all meals starting with lunch on Day 1 until breakfast on Day 14; all entrance fees; expert local trekking guides; activities, tours and monastery visits; surface transport and airport transfers in Bhutan; most camping gear including four-season tents, thermal foam mattress; all additional camp equipment; all fees related to tourism development, internal taxes and charges including visa fees; gratuities for local staff. We will be joined on this adventure by expert expedition guides and a Modern Adventure trip leader. How difficult is this adventure? This is considered a moderate trekking adventure. 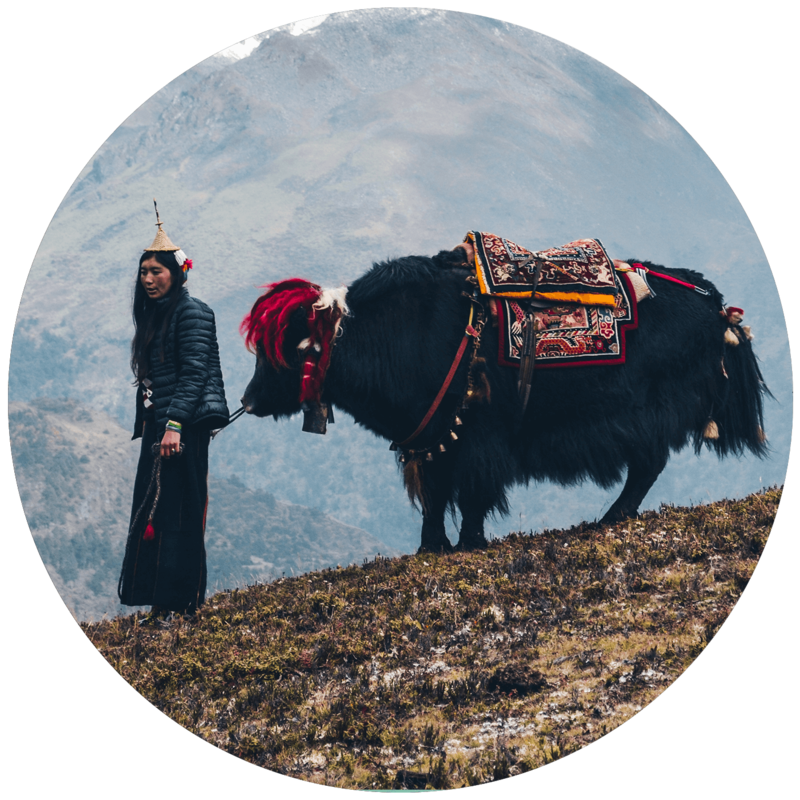 You will be carrying a day pack each day, with our own water and daily supplies, while the rest of our luggage is transferred between campsites and lodges with the help of horses and yaks. We’ll follow well-maintained paths but sometimes go off-trail, and will sleep either in group campsites or remote village lodges. This adventure has been planned keeping a steady climb in height over a number of days to permit for the necessary time for you to acclimatize to high altitude. We strongly recommend that participants have a good level of fitness and are well prepared. While this trek is open for all skill levels, previous hiking experience is a benefit. What are the arrival and departure details? We recommend arriving at the Suvarnabhumi Airport (BKK) in Bangkok, Thailand on or before Wednesday, October 16, 2019 giving you time to acclimate, relax and refresh before the adventure begins. This adventure will begin promptly with a flight to Paro, Bhutan, on October 17. If you miss this group flight you are responsible for additional change fees and costs associated with obtaining a new flight. This adventure ends on October 30, 2019. As a part of your booking cost, we will take a group transfer flight from Paro back to the Suvarnabhumi Airport in Bangkok, Thailand. Your flight home should depart from BKK no sooner than 3pm on October 30, 2019. What are the accommodations on this adventure? 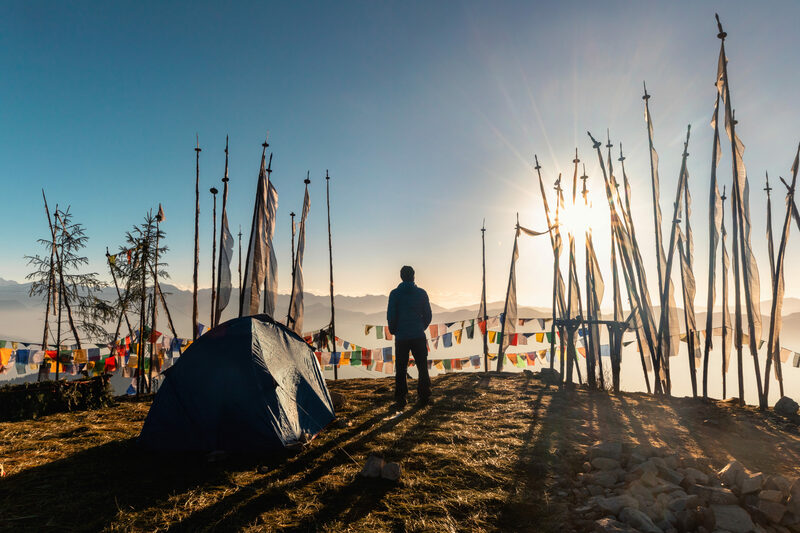 We split our time camping in the mountains of Bhutan, in comfortable camps set up by our trekking teams; and in comfortable hotels and resorts in Paro, Thimpu, and Punakha. This adventure is recommended for travelers aged 19 and above who are in good health and have some experience with hiking. Guests are a mix of couples, friends traveling together, and solo travelers. On our trek will travel fully supported with two cooks, a local guide, trek helpers, horsemen and yak wranglers. This adventure will be limited to no more than 20 fellow adventurers and your Modern Adventure team. Prices are based on double occupancy. If you wish to be paired up with a roommate of the same gender, select ‘Single: Willing to Share’ at check out. Modern Adventure will pair you up with a roommate of the same gender to share a tent and hotel/resort accommodations with. If you are a solo traveler and want to have your own accommodations, a $800 supplement will apply at checkout; these spots are very limited due to the type of accommodations on our adventure and are available on a first-come, first-serve basis (See our Terms and Conditions for full details). U.S. citizens carrying a tourist passport and in possession of an onward or return airline ticket do not require a visa to enter Thailand. The passport must have at least six months validity remaining to be allowed entry. If you plan on staying in Thailand for an extended period of time requirements may vary. You will need a Bhutanese visa to enter and exit Bhutan. All tourist visas are issued through local licensed tour operators. After you book, Modern Adventure will oversee and gather all necessary documentation needed for you to enter and exit Bhutan as it is included in your trips cost. For citizens of other countries, please check with the Bhutanese Embassy or Consulate for information and requirements. Roundtrip airfare to/from Bangkok, Thailand (the trip starting and ending point); travel insurance; transportation to the trip’s meeting point; activities not included in the trip itinerary; personal incidentals including room service, laundry, etc; personal gear; gratuity for tour leader, donations to monasteries. You may cancel on or before July 13, 2019 and receive a full refund minus a $500 per-person service fee. If you cancel between July 14 and August 17, 2019 there is a 50% cancellation fee. On or after August 18, 2019 there is a 100% cancellation fee. We highly recommend purchasing travel insurance as we are not able to make exceptions to this policy in cases family/medical emergency or cases of the trip being cancelled (See our Terms and Conditions for full details).